"I Talk About Day, You Talk about Night Time"
For an artist largely associated with the excesses of the glam era, making a mostly unadorned, acoustic record can be a risky venture. When you’ve stripped your songs down to the essential elements, all that remains to be seen is if the singing, instrumental performance, and material holds up to the extra scrutiny. No amount of glitter, affectation, or other scintillation can fully make up for a lack of substance in those areas. 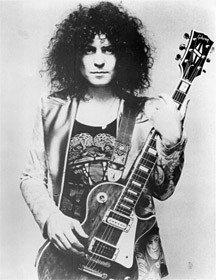 The idea of Marc Bolan taking popular, electric-guitar-centered T. Rex tunes and reconfiguring them for acoustic performance as he does on Acoustic Warrior is surely an intriguing one–something of both a nod to and inversion of Tyrannosaurus Rex, Bolan’s acoustic duo prior to T.Rex). But it isn’t a sustainable one for more than half a record, so all but diehard fans and completists might find themselves restless about halfway through. The singing is good, the performances strong enough, but two things keep this from having broader appeal and holding the listener’s attention, and these hold for both newbs and fanatics alike. Bolan’s lyrics prove somewhat problematic here, too. Ordinarily–that is to say, when listening to a fully plugged-in T. Rex–Bolan’s words don’t matter much to me. It’s not that they aren’t important; it’s more that I focus on the sounds of the words brushing against one another, the images they conjure and what they evoke, and not a particular message or poetic quality. That serves me well. On Acoustic Warrior, however, the intimacy conveyed by the context puts the lyrics into sharp relief, throwing an occasionally unflattering spotlight on their “shortcomings.” That doesn’t make the lyrics meaningless or without all value, but having the lyrics on display without Bolan’s accompanying fretwork bolstering them paints an incomplete picture of why he and T. Rex got so popular in the first place. The exercise skirts novelty by being mostly well executed. Some tracks, rather than sounding more poignant or urgent in this context simply sound slight, needing Bolan’s signature Les Paul choogle and crunch to raise them from being okay to being as great as their studio-crafted counterparts. By putting so much focus on his mystic-space-hippie lyrics and less on the interplay between them and his guitar work, Bolan inadvertently reveals his only weakness while simultaneously muting the source of his greatest strength. While this incarnation offers a few exciting moments and appealing takes on familiar hits, I much prefer the Electric Warrior to warbly-falsetto’d wizards high on hippie gumbo, much as I like some Tyrannosaurus Rex in small doses. After the Unplugged-esque thrill wears off, there’s not a lot left to listen to more than once. My recommendation is to graft these cuts into a larger, random playlist mix; this goes a long way towards proving that, in this case, the parts are worth more than their sum. The album ‘Acoustic Warrior’ is a travesty of an album. It was released by a ‘Charlatan’ that attempted to dupe the music world with what he described as new found tapes of Marc at an acoustic concert. He added audience noise and a false reverb to the recordings amongst other things, to add insult to injury! We Marc Bolan fans already had the unretouched original single acoustic tracks on different formats scattered about in our collections. That is what alerted us to what had gone on and I can tell you it caused a real furore in the Marc Bolan camp. The guy who released this album has since gone to ground and I very much doubt he will raise his head as I for one and I know of a few others would lke a word with him. Why its still being sold is beyond me. It looks as though the the music world is still being duped. I agree, the album is a series of demo’s, Marc would never have put it out. But then I again I love T.REX and I wouldn’t be without it, but wouldn’t play it to non-T.REX fans. And why the review this album has been out for 15 years, or is this a new version. Imagine if such wonderful exciting rock ‘n’ roll music hadn’t been accompanied by predominantly meaningless lyrics. While I happily admit that every line of ”Solid Gold Easy Action”, which I read in Disco 45 magazine during Christmas ’72, somehow spoke to my pre-ten soul, it took only a couple more years to realize that the similar abstract glam-flash attack within the lyrics of other glittery heroes such as David Bowie, Sparks and Roxy Music also contained substance beneath the surface. “Bump and grind” has indeed been very “good for” my own “mind” but ultimately… I, and peak rock ‘n’ roll pantheon placement, need so much more. Thanks for your thoughtful comment, romyjones!